Stop the employer from doing what workers don’t want, such as firing employees without justification, discriminating against workers, making changes without workers’ input, and cutting staff to increase profits. Make the employer do what workers want, like paying fair wages, providing decent benefits, and hiring enough staff to provide quality care. Individual workers, on their own, just can’t match the power of the employer, because the employer has the ability to fire workers. Without a union, the employer can cut pay, eliminate benefits, change working conditions, or fire employees for no reason. For more than two hundred years workers have learned that they can match the strength of their employer if they stand together as a group. One common misunderstanding — one that is often encouraged and reinforced by employers — is that a union is an outside entity, a third party that intervenes between management and workers. It’s simply not true. You and your co-workers are the union. Together you set your goals, choose your representatives, and negotiate with the employer. The union consists of the workers, standing together and speaking with one voice. So when the employer attacks the union, the employer is really attacking you and your co-workers and your right to stand together and use your collective power to make your voice heard. By joining and participating in a union, you are taking part in a movement that has a long history. As a union member, you benefit not only from the gains won by your union in your workplace, but by all unions in all workplaces, going back decades, even centuries. Many of the workplace standards we now take for granted were initiated, fought for, and won by unions. The eight-hour work day, the five-day work week, sick pay, vacation pay, maternity and paternity leave, retirement benefits, health care coverage — none of these were willingly offered by benevolent employers eager to improve the lives of their workers. These benefits were demanded and won by workers, by union members who fought, sacrificed, and even died in the struggle for workers’ rights. 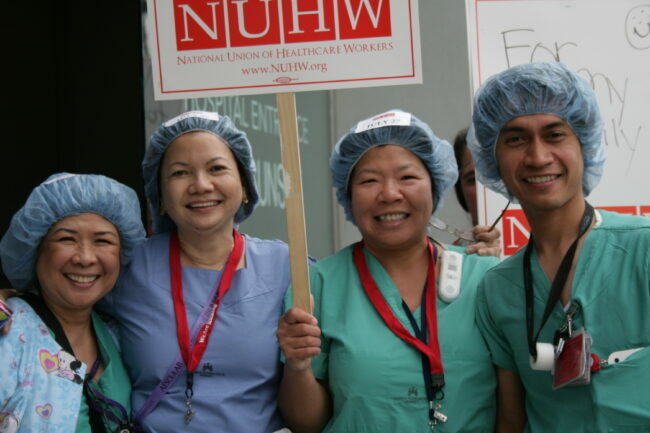 NUHW and its predecessor unions, SEIU–UHW and Local 250, have been responsible for many of the most significant gains that healthcare workers have made since Local 250’s founding in San Francisco in 1934. By standing together with your fellow workers, you are honoring the efforts and sacrifices of previous generations of workers and helping to ensure better pay and working conditions for future generations. The National Union of Healthcare Workers, a member-driven movement for democracy, quality patient care, and a stronger voice in the workplace, is committed to building a model union by dedicating itself to the following principles. Democracy Union members elect union officers, executive board members, stewards, and rank-and-file bargaining team members; negotiate and ratify their contracts; and vote on changes to the union’s Constitution and Bylaws. Workplace Organization The union is strongest when workers elect a steward from every department and every shift and hold regular steward council meetings. Training and Development NUHW conducts regular training sessions for stewards to develop their representation skills. Patient Advocacy NUHW is committed to its watchdog role in the workplace. As the last line of defense for our patients, we must ensure that they receive the care they need and deserve. New Organizing Not only does organizing the unorganized bring new opportunities to more workers, but raising the wages and benefits of your employer’s competitors helps you win higher economic standards from your employer. Political Action Healthcare is financed and regulated by elected government officials. Healthcare and insurance corporations are heavily involved in the political process, influencing decisions that impact our industry. We need to be involved, too. We need to ensure that the voice of healthcare workers is part of the discussion. Research By investigating the standards and practices of employers, we equip ourselves with valuable information in negotiating fair, equitable contracts for workers. Communication A vital element of our work is getting the word out to our members, the public, and the media. Why is there conflict between management and workers? The conflict between management and workers does not exist because managers are inherently bad and workers inherently good. It’s a systemic problem: The conflict exists because the employer makes a profit by demanding as much work as possible from employees in exchange for an hourly wage. The more work produced at a lower hourly wage, the more the employer profits. This is especially true in a labor-intensive industry like healthcare, where labor accounts for more than fifty percent of an employer’s costs. This gives the employer a greater motivation to get more work out of fewer people. It increases the employer’s profits. In the healthcare industry, there really isn’t much difference between a for-profit and a non-profit institution. Most healthcare employers are large corporations where the CEO and other top administrators command millions of dollars per year in salaries and benefits — typically more than two hundred times what the average worker earns in a single year. When healthcare workers are not represented by a union, management determines what workers are paid, what benefits workers receive, how many workers will get shifts, who will get them, and who will be laid off. But when healthcare workers come together and form a union, the workers have the collective power to demand a voice in these important issues. This is why employers oppose unions. A union contract, sometimes referred to as a collective bargaining agreement, is the legal, binding agreement negotiated between the union — you and your co-workers — and the employer. It sets forth the rates of pay, benefits, and other terms and conditions of employment. The contract represents what the union, through its collective strength, has forced the employer to agree to. Although management often implies that it would provide good wages and benefits without pressure from a union, history shows that employers rarely offer higher pay, better benefits, or improved working conditions beyond the bare minimum unless compelled to do so. The union is the institution that forces an employer to go beyond the bare minimum, and the union contract incorporates those improvements into a legally enforceable document. A union contract is unlike other types of contracts, like those used to purchase a car or a house. If those kinds of contracts are violated, you have to go to court and then convince a judge to enforce them. By contrast, you and your co-workers are responsible for enforcing the union contract. Employers, in the pursuit of greater profits, often try to get around the contract. It is the union’s job to see that they don’t. If you and your co-workers do not vigilantly enforce the contract, then the employer has no reason to abide by it. Union members enforce the contract through a variety of means: petitions, meetings, collective action, and through the grievance procedure. Effective contract enforcement requires union members to be well-informed, unified in purpose, and well-organized. To accomplish this, members in each department or unit of the workplace elect a well-respected co-worker as a shop steward. The workplace’s democratically elected shop stewards meet monthly to organize the workers’ collective power. Through meetings and through actions democratically determined by the membership, stewards and rank-and-file members must work hand-in-hand to ensure that the contract is enforced and that the employer is held accountable to the contract. Collectively, the members assess problems and decide how they should be addressed, whether through a grievance procedure or some other means. Member participation is vital. These are important decisions that require unity among the membership. In workplaces where members are active, the union is strong; where participation is low, the union is weak. It is only when workers actively participate in building the union that we have the power to force the employer to provide quality patient care, safe working conditions, and good pay and benefits. Member dues are the union’s only source of funding; it is the members themselves who provide the resources necessary to operate their union. This not only ensures that members have a stake in the success of their union but also ensures that the union remains independent, with no obligations to anyone but the membership. Dues pay for union staff salaries, offices, supplies and utilities, negotiation and organizing costs, legal fees, and affiliation fees to other labor organizations. 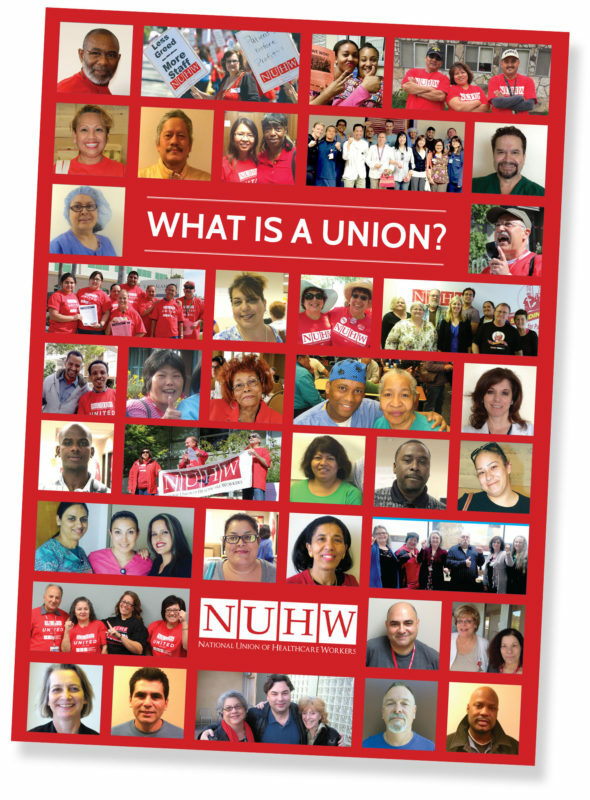 NUHW members established the dues formula through a democratic, union-wide vote. The NUHW Constitution and Bylaws, ratified by a membership vote, established the dues formula at 1.5 percent of a member’s straight-time hourly base wage rate. In other words, you don’t pay dues based on overtime; you pay dues only on your regular pay for regular hours. And each month, one dollar of your dues goes into the union’s Strike Fund, which ensures that if workers vote to strike there are resources available to make the strike successful. There are a few common misconceptions about union dues. Employers often use unions and union dues to frighten workers. They sometimes tell new employees that they are required to join the union and that they will be forced to give up their hard-earned pay to a third party, with little in return. You are not required to join the union, but it is true that employees in a unionized workplace are required to pay dues as a condition of employment, because whether you are a union member or not, you benefit from previous and future contracts negotiated by the union. The union’s financial health enables us to expand the power of healthcare workers by unionizing unorganized workplaces. This brings more members into the union, which gives us greater leverage in negotiating contracts with employers. But it has a larger effect as well. The lower wages and benefits paid to non-union workplaces hold down the wages of unionized workplaces, because employers with unionized workplaces can always point to the lower wages of their non-union competitors and say they need to cut wages and benefits in order to remain competitive. If more workplaces are unionized, it takes wages and benefits — labor costs — out of the equation when employers compete with one another. Employers then have to compete based on the quality of care they provide rather than how cheaply they provide it. By taking an industry-wide approach, we can improve wages, benefits, and working conditions for all healthcare workers. Nearly all of the components of the healthcare industry — from insurance companies and healthcare systems to doctors, medical suppliers, and drug companies — are organized to promote their interests. Healthcare workers should be organized, too. The power of the union comes from uniting all workers hired by the employer. The union must be truly democratic with room for everyone, including those with different ideas. The union should be the safest place in our society to disagree, a place where all workers and all ideas are welcome. We do not choose who belongs to our union; employers choose who belongs to the union by whom they choose to hire. Collectively we must work with everyone the employers hire, including new hires and probationary employees, to create the unity and strength we need to win goals that we all support. Workers make up a majority of the population, but employers and their administrators and managers, who make up just a small part of the population, exercise tremendous influence over the rest of us. To remain powerful, and to undermine the enormous power that workers have when they are united, employers continually attempt to divide workers — by job classification, education and training, and even by age, gender, race, ethnicity, sexual orientation, gender identity, and legal status. Employers try to use our differences to divide and weaken our union. NUHW fights discrimination in three ways. First, we support all movements that fight against racism, bigotry, and prejudice of any kind. Second, our contracts include strong language that prohibits the employer from discriminating based on the basis of race, creed, sexual orientation, age, gender, gender identification, and union activity. Third, we have a simple standard: all union members have the absolute right to be judged based on their own actions and behavior, regardless of what they look like, where they come from, what language they speak, who they love, or what religion they practice, if any. We believe that an injury to one is an injury to all, and that what unites us is good and what divides us is bad. Political action is critical in the healthcare industry. Every day, politicians and regulators make significant decisions at City Hall, Sacramento, and Washington D.C. that affect the healthcare industry, healthcare providers, and our patients. Healthcare corporations, insurance providers, drug companies, doctors, and other interest groups are heavily involved in the political process; we need to be involved, too. We need to ensure that the voice of healthcare workers is part of the discussion. Our participation is especially vital in light of the 2016 federal election results; not only is healthcare on the line, but also the rights of workers and immigrants. The amount of public money devoted to healthcare, through Medicare and Medicaid primarily, but also at the local government level, is the result of political decisions. We fight with employers for our share of the budget, and we fight with politicians for our share of city, county, state, and federal budgets. Political involvement is crucial. We encourage our members to vote, but a real political voice for workers and our patients requires much more than that. Healthcare workers must be proactive in in holding elected officials accountable. Corporate lobbyists have succeeded in passing legislation that prohibits unions from using dues revenue in the federal political process. That weakens our ability to influence political decisions that would be favorable to healthcare workers and patients. The only way we can raise money to have a voice in these important decisions is to ask our members to make voluntary donations to the union’s Committee on Political Education Fund (COPE). We have no other source of money to advocate for federal legislation or elected leaders who will protect patients and healthcare workers. Healthcare is a human right. We believe that the best way to ensure quality coverage for all is with a single-payer healthcare system, and the best way to achieve that is by improving and expanding Medicare to cover everyone. By expanding the nation’s most successful and efficient healthcare program to cover everyone, we could solve the country’s healthcare crisis once and for all. Under an expanded Medicare plan everyone would be included, regardless of age, pre-existing medical conditions, or ability to pay. Costs would be controlled through the elimination of wasteful insurance industry paperwork and expensive and unnecessary bureaucracies. We could then shift our focus toward preventive primary care, striving to keep people healthy rather than waiting until they get sick. Caregivers and patients, not profit-driven insurance companies, would be in control of making healthcare decisions. The prospects of Medicare For All may not be bright in the current political environment; even the gains made under the Affordable Care Act are at risk under the new federal government. But the attacks on the Affordable Care Act have actually helped our cause in California by galvanizing healthcare reform advocates to push for a statewide single-payer system. NUHW has also taken a leading role in pushing for mental health parity by holding healthcare providers accountable for offering mental healthcare that is on par with primary healthcare. We forced Kaiser Permanente to start addressing the problem and we are expanding our efforts to other healthcare systems and providers. The strength of NUHW comes from what we put into it. Employers continue to require more from healthcare workers. To be successful in winning favorable conditions for ourselves and our patients, healthcare workers have to be strong and united. Standing together means supporting our co-workers on and off the job. In 2017, in response to the new balance of power in Washington, D.C., our union passed a resolution declaring NUHW a “sanctuary union” to help protect and support our immigrant co-workers and their families and loved ones. Our union functions through meetings, committees, and involving members in making decisions that affect them. We encourage our members to get involved. Together we are building the model union.